DreamHost Hacked - Change Your Passwords Now ! All Dreamhost customers should read this post immediately and change all related passwords (including WordPress ones). 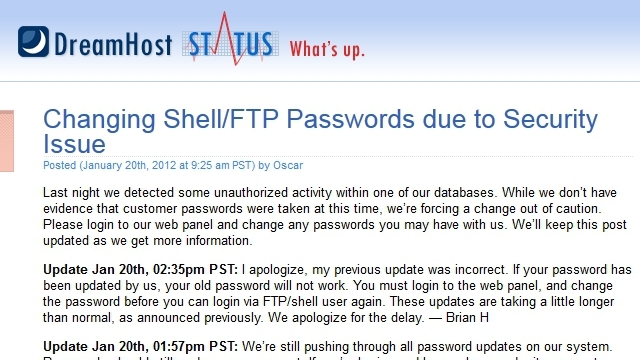 Dreamhost said "Last night we detected some unauthorized activity within one of our databases." They say there's "no evidence that customer passwords were taken", but they''re pushing out password changes to everyone just to be safe. In addition, you should change any of your other passwords just to be safe that is, if they're at all similar to your DreamHost password. To edit your password in the panel, please log into the web panel and go to Manage Users. Click edit next to the FTP/shell user on the right and you can change your password there. This is the second time within week, when hackers targeted to these big websites, Dreamhost don’t give any clue of the hack.